I like mint touch in any fruit drink n with mango mint suits very well and this is on the perfect drink for Hot Sunny days. Very simple and easy to make. The original recipe calls for canned mango drink but here i used fresh mango pulp. Do give it a try, am sure you will love it!! First , wash n peel the mango and roughly chop it and blend to a smooth puree with water n sugar. In a pitcher, add lime juice n crushed mint leaves and mix well. Then add mango puree to the lime juice -mint leaves mixture and stir well and leave it refrigerated for 1 hour or more. 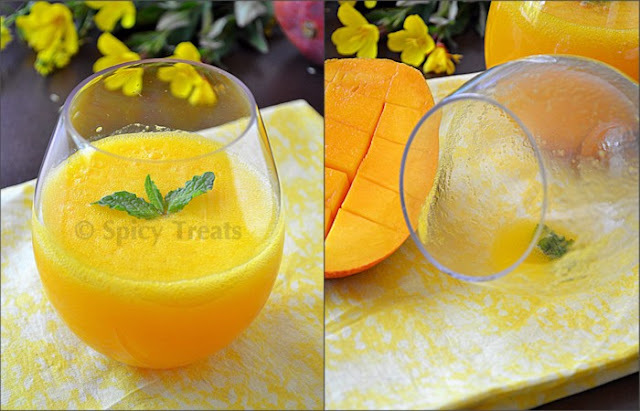 After refrigeration, filter the mango juice using strainer and pour in to the serving glasses and top it with sparkling water and Enjoy!! If u want add some crushed ice or ice cubes. touch of mint makes a drink tastier.. king of the fruits along with mint.. perfect combo..
Wow! very refreshing and colorful. I have not tried mint with any juice, looks awesome. Wow......so refreshing.......I am tempted to make it right now. Refreshing drink...Nice clicks...Love the yellow..
lovely and so refreshing!loved the presentation and the beautiful clicks! Refreshing and tempting pictures... I always end up eating the mangoes don't ever have any left for make anything with it...yea I'm mango crazy... I must try this. Sangeetha the pics are gr8 the drink looks so amazingly refreshing.Cheers! Super flavourful drink, love the addition of mint. Delicious, feel like having some..
looks so refreshing and loved the color,anything with mango is my family's favorite,will try it soon. Sounds like a wonderful combination of flavors.And as always your pictures are a delight to look at. Sangee the drink looks fantastic and your clicks are always beautiful. I don't know why you think otherwise. You are one of my inspirational photographers. Thank You so much Sadhana for those very sweet comment...really u people are encouraging me much more,without your support i am none!! Beautiful photos Sangeetha... very refreshing... brilliant colours... love it... i especially loved the one with empty glass just above the 'method' section... way to go girl!! Thanks...Thanks a lot Roshni! At least you mentioned it, so happy that u loved it...really i put much effort n time for these pics...i expect a lot from my blogger friends, Particularly for that pic but none specified :( Very happy that u noticed n appreciated for that...Thanks a bunch!! Thanks Everyone for your lovely comments...keep supporting!! perfect n refreshing drink for summer !!!!! !love your clicks n mostly the way you presented it !!!!! Delicious n refreshing drink, lovely presentation. They look amazing! I love your pictures. This looks delicious. Can you tell me the total number of servings for this receipe? Makes nearly 4 cups of Juice - can serve 2 or 3!